We have a neighborhood-focused ride full of holiday lights this month. Arrive on time! Wheels hit the street @ 8pm! 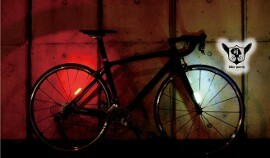 Light up your bike! It’s dark, it’s the holidays, DO IT. Please don’t forget to follow the “How We Ride.” Make this a successful ride by keeping fellow riders, pedestrians, and cars happy and safe on their commute. We don’t want any crashes or $400 tickets. Bring a canned food item or two to be donated to Second Harvest Food Bank. The route for the event is here: Scarf Ride Route Map. 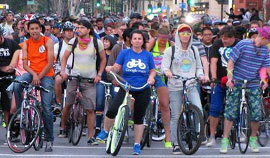 The starting and ending point of the ride is 101 Paseo de San Antonio Walk – by the SJ Rep. Please do NOT park at the starting location.